Heat pumps were a hot topic at NESEA's Building Energy conference in Boston last week. They have several benefits, they work well in cold climates, and they also can be the secret sauce in what may be the most popular movement in energy efficient housing. So let’s get right to the important question here: Why do these people in the cold climate of New England love heat pumps so much? Most of his talk was about minisplit heat pumps, but he also spoke about ground-source heat pumps (GSHP) and heat-pump water heaters (HPWH). He’s not a fan of GSHPs. He said that although air-source technology is less efficient than connecting with the ground in theory, he’s found the reality to be otherwise. So he sticks with air-source heat pumps, primarily of the minisplit variety, for space heating and cooling. Rosenbaum has had good experience with heat-pump water heaters. One thing he’s looked at is the effect of location on their performance. He wanted to know, for example, if a HPWH located in a basement might create more of a moisture problem, with an increased likelihood of growing mold. Yes, the heat pump will cool and dehumidify, but doesn’t necessarily mean the dew point of the air will decrease. By datalogging the performance, he found that temperature, relative humidity, and dew point all went down for a HPWH running in a basement. Also, as you might expect from someone who writes a blog titled Thriving on Low Carbon, Rosenbaum compared carbon emissions for water heaters using different fuels. He found that going from an oil-fired boiler to an HPWH dropped CO2 emissions by 89%. Can you heat the entire house with one minisplit unit? 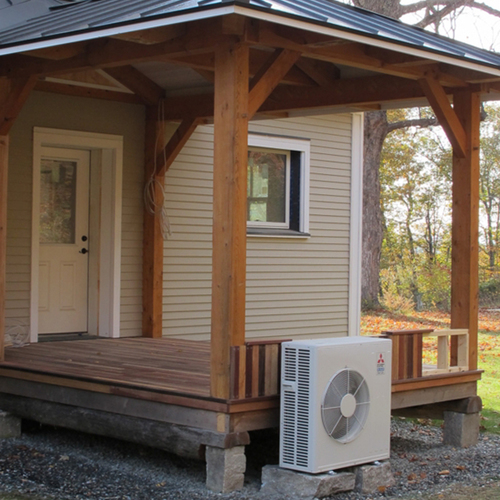 On that question of heating a whole house in a cold climate with a single ductless minisplit heat pump, I recall a couple of years ago hearing homebuilder Carter Scott speak at Building Science Summer Camp about the superinsulated, net-zero-energy homes he was building. Can they provide enough heat? 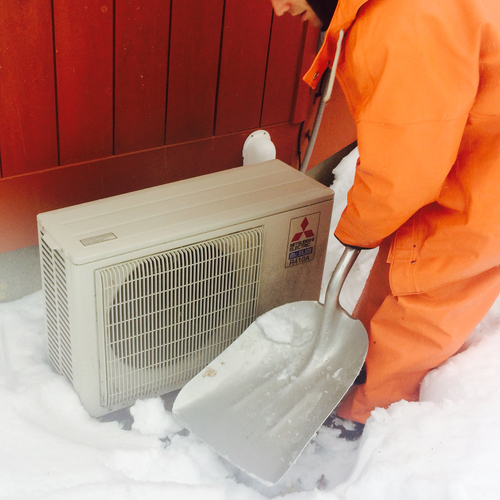 We have more than enough evidence to state unequivocally that heat pumps work in cold climates. Air-source heat pumps naturally lose capacity as the outdoor air gets colder. That means that you may need a source of supplemental heat if the heating capacity drops below the heating load. No big deal. We know how to do that. Most standard air-source heat pumps are equipped with electric resistance heat to supplement what the heat pump provides. One of the really cool things about minisplits, though, is that when you pair them with a low-load — or, as Andy Shapiro said, a micro-load — house, you may never even need any supplemental heat. Many models actually have more heating capacity than cooling capacity and can continue pumping heat from cold outdoor air at temperatures well below zero (that’s Fahrenheit because so many cling to that outdated scale). And this isn’t just a hopeful statement from manufacturers. Rosenbaum reported that his projects handle below-zero weather with no problem. Heat pumps work. One piece of equipment heats and cools. It works in cold climates. It’s efficient. But if you recall my list from the beginning of this article, one of the other terms I heard a lot holds the key to perhaps the biggest motivation for many in the NESEA crowd. (No, it wasn’t whisky, though a nice single malt can be very motivating.) If you want a net-zero-energy home, the clearest way to get there is by going all-electric. Shapiro said it best: “We know how to make electricity onsite.” Build an all-electric, micro-load home, add enough photovoltaic modules, and voilÃ , you’re at net zero energy use, producing as much as you use. Richard Faesy repeated and amplified the drive to going all-electric as a panelist in the closing session. “We need to electrify all fossil fuel end uses,” he said, because that gives us the best chance of reducing the effects of climate change. Don’t get me wrong. There are still plenty of people in New England and other cold climates who love furnaces and boilers. The folks at NESEA’s Building Energy conference, however, are in the vanguard of those who are rethinking how we design, construct, and operate buildings. And heat pumps are just fine with them. I'm a homeowner in the final design phase of our new custom home in Nashville, TN. I've spent countless hours wading through online info on all things energy efficiency. Most will agree that ductless mini splits are all the rage amongst high performance home experts, but I still don't see how they are a better than ground source heat pumps when you include the 30% tax credit for geo. For example, the geo system I was quoted recently was about a 25% premium over a standard, builder grade, heat pump system when you include the tax credit. I've asked the HVAC company to price me a mini split, but I'm guessing it is going to be far more expensive. GSHP runs upward 20 000$CAD ..i've seen some folks shelling out up to 60K$CAD for a GSHP that required maintenance in the first 3-4 years . simplicity and cost for almost the same efficiency wins everytime. ( running at lower operating % ) and less noise! for now and probably quite some time to come, i'm sold to minis. "Most will agree that ductless mini splits are all the rage amongst high performance home experts, but I still don't see how they are a better than ground source heat pumps when you include the 30% tax credit for geo." Ever priced drilling wells in granite? In a recent rebate program in Connecticut the AVERAGE GSHP system was about 5 tons, and cost over $9000/ton. I'm sure there were some trenched-in-slinkys in the mix that were cheaper, but that means the well-drilled units were probably averaging over $10K/ton. A 30% tax credit cuts that to $6300/ton, so after subsidy (including the $1500 from the CT utility) the average 5-ton system came in at thirty grand, cash out of pocket. In the same region top-of-the line mini-splits cost LESS than $4000/ton, with far fewer system design issues to get the performance out of them as with GSHP, which are all semi-custom designs, and even without subsidy 5 tons of ductless comes in at $20K, at $10K in savings that can be applied elsewhere. And the "typical" all-in COP of GSHP (with all pumping and air handler power accounted for) in this heating dominated climate is about 3.5, compared to R3.0-R3.5 for better class mini-splits in this region, depending on the exact local climate. You can spent the $10K difference in up-front cost on rooftop photovoltaics (even without subsidy) you end up using less annual grid-energy, even in the colder parts of New England where the mini-split solution is only averaging a COP of 3. Now that the installed price of rooftop PV is in the $3/watt range (half that, after federal & state subsidies in MA/CT) given the slim (if any) efficiency advantage it's harder to really make the case for ground source heat pumps. That's particularly true in new construction, where you have control over the room-by-room heat loads. It can still make retrofit-sense in hard-to-retrofit heat-lossy homes where room to room temperature balance may be harder to control with just a few ductless heads, but even there it's worth doing the math on what it takes to bring the room-losses down to achieve reasonable balance. While it's dead-easy to spec a mini-split for a high-R house, they are not just for low-load homes anymore. Embrace change. Living is just that, changing. I am shaking my head while I type this. I love change, embrace change, chase after change. How does the efficiency of a mini split compare to electric heat at temp below freezing and again close to zero. Is a min split really less polluting than a 90+ natural gas furnace? Q1) Is Marc Rosenbaum's presentation available? I don't see it at the BE14 site. I'm curious to know details of his conclusion that the HPWH cuts GHG emissions by 89%. I'm not doubting it, just wonder what the exact situation was that made up his comparison. Q2) How crazy would it be to heat a home with a few HPWHs in the basement connected to the baseboard/radiator system? Oh how I do prefer water for my heat distribution... Clarification: the HPWHs would be in a basement, giving them at least nominal access to heat from the ground. I realize that being heat pumps, the original heat has to come from somewhere. I suppose I'd need an enormous basement to make this work and that I can answer my own question with "very crazy." Oh well. Q. "How crazy would it be to heat a home with a few HPWHs in the basement connected to the baseboard/radiator system?" A. Pretty crazy. If your HPWH is indoors, it is making the space where it is located colder, not warmer. 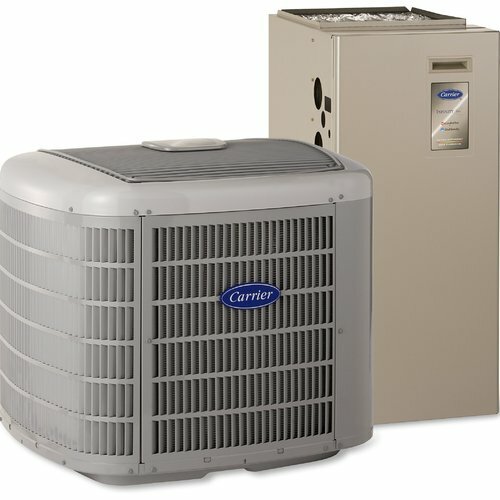 If you want to use an air-source heat pump to heat your house, you need to locate the condenser outdoors. So, if you insist on distributing your space heat using water flowing through tubing, then your only real alternative is an expensive Daikin Altherma. Or you can join the crowd and install a few ductless minisplits instead. I got quoted $5k a ton for standard issue new install hvac and ducting from one (recommended and reputable) company. I'm thinking that is way high since my builder gave me budget number of $3k a ton(but I guarantee you my builder's guy is "old school" hvac). I'm starting to wonder if the company I talked to inflated the price of the standard build to try to sell me on the gshp. Allison, I think you have it pretty much right, from the perspective of very low-load houses (new and deep retrofit). I have been living with a mini-split heat pump for two winters now, and I also presented at the NESEA conference on the results of extensive monitoring that I conducted in winter 2012-13. My 20-year old house is fairly efficient, but nowhere near current net-zero or “micro-load” designs. This 1.3-ton heat pump heated my house last winter for about $400, with a net heating COP of 2.9; and performed very close to manufacturer’s specs – with a winter as-measured of just under 6900 HDD65. What’s missing from your post is a perspective on how these systems can be used for existing, not-so-special (or even really terrible) homes right now to save $ and carbon. Basically anyone in a cold climate who is heating with oil, LP gas, or electric resistance heat could install one of these (maybe two or three at most, depending on the layout of their house) and save 30-60% of their current heating bill, as well as cutting net carbon emissions by a large margin. They don’t have to heat the entire house with the heat pump—just turn up the temperature setting and get as much heat as they can, and use the existing (expensive) heat as a backup for the coldest weather and to balance the temperature in more remote rooms. It’s also important to remember that we’re talking about inverter-drive, cold climate heat pumps—those with variable speeds and HSPF ratings of 10 or more. 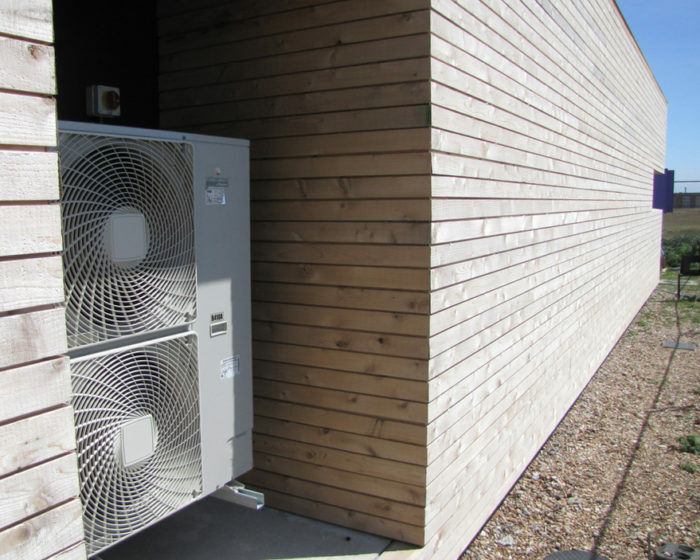 I find one of the biggest barriers to more widespread adoption of air-sourced heat pumps in northern climates is that the very contractors who would install them are often completely unaware of their suitability and high efficiency in cold climates. One of the three dealers who I invited to give me a quote for my installation tried to convince me that “these things work fine in Texas or Oklahoma”, but that it definitely won’t heat my house in Vermont. The fact that I’d done load calculations and planned a system that could meet the load at the design temperature of 2F didn’t convince him—he just reiterated his point. (another tried to sell me a GSHP). On the other hand, more and more installers are getting it. And we’re starting to see oil dealers in New England who are adding the installation and service of mini-splits to their product line. It’s a great fit, allowing them to really serve their long-term customers with a money- and carbon-saving alternative that in most cases they really can’t get from any other technology. Mini-split installation in an existing house should be accompanied by basic weatherization—insulation and air sealing, if not a more aggressive retrofit. But for folks who are struggling with the very high cost of oil heat, adding a mini split or two could save them enough money in a few years to take on weatherization that they may not otherwise be able to afford. The retrofit market is somewhat secondary at NESEA events, where the emphasis (as you point out) is on really low-load homes. But existing housing stock won’t be deep-retrofitted very quickly, and mini-splits can serve an important role in filling the gap. And a mini-split, is much more affordable than a ground-source heat pump: Andy Meyer (my co-presenter) found the average price for a single-head system across 1000 market-rate residential installations in his Efficiency Maine program was just over $3200 installed. That price might add up quickly if you installed a separate zone in every room, but the biggest heating savings for most homes will come from the first unit or two. That’s a lot cheaper than a retrofitted GSHP, even with the tax credit. PS: I’ll be presenting again at the Affordable Comfort conference in Detroit—hope to see you there Allison! PPS: @Robert--my Fujitsu 15 RLS2 has an efficiency (I measured it) of over 2 even below zero F, is pretty steady around 3 between 10-30F, and climbs steadily above freezing. Net efficiency for @6900 HDD winter was 2.9. How mini-splits compare with natural gas depends on the electricity mix--but for most of the country, there won't be a noticeable advantage. There is a big advantage, however, when compared with oil, both on operating cost and carbon emissions, for whatever oil heat the mini-spilt offsets. Please define your limits of New England when you generalize that "New Englanders" love heat pumps. CT is New England, but differs quite a bit from Sugarloaf Maine which is also New England. Please disclose fully the capabilities of this stuff before broadcasting that they are all -serving. I'm not against them, but be honest....thanks. There are still some people out there that don't believe a ductless mini split is as good of a design choice as a standard ducted HVAC system. Even some disparaging comments like, "ductless mini splits belong only in mud huts" and other disingenuous comments have been made. The claim is that there is no scientific data backing up the claims that ductless minis can heat/cool a home properly, or as well as a ducted HVAC system. Maybe creating a case study journal link here on GBA that people can reference when they have questions about minis? I believe in ductless minis and their abilities to efficiently cool/heat a home but there are many doubters out there still. Europe and Asia accepted minis but here in the USA the old ducted HVAC industry is hesitant to change. Concerning your PPS: Yes, I know that when an appliance is located within a home's conditioned envelope, all of the electricity used by the appliance is converted to heat. My shorthand answer -- "If your HPWH is indoors, it is making the space where it is located colder, not warmer" -- referred to the room where the HPWH is located, not the building. "Obviously, an air-source heat pump moves heat from the air around it to the water in the tank. This won't help you provide space heat if the HPWH is located indoors -- gathering heat from the air just cools the house instead of heating the house. The heat you have gathered from the air is then sent back to warm the air you just cooled; the net effect is to heat the house slightly because of the waste heat thrown off by the compressor motor. It makes more sense to use an electric resistance heater than to do that." You suggested that GBA should create a "case study journal link that people can reference when they have questions about minisplits." I'm not sure exactly what you mean, but I think that what you seek may already exist; see the box on this page titled "Related Articles." The box includes links to 13 articles, most of which are case studies of homes with ductless minisplits. My home was built in 1992 with electric baseboard heat. I installed programmable thermostats that saved some money. When I retired we could only set back while sleeping, so we installed a hyper heat 12000 btu Mitsubishi mini split.. It has performed flawlessly over the last 3 winters. We set the baseboard thermostats about 4 F less than the mini split. They have come on a few times during the winter, but the heat pump has worked down to -18 F. Our heating cost is 50% of previous times. We installed the indoor head right over the LED electric fireplace. You can stand in front of the fireplace and warm up in the flow from the heat pump. Love this installation! Are you most concerned with heating or cooling performance? Do you want or need a distribution system for hot or cold air? Is 5 tons truly the load your design calls for? The effects of point-source heating of ductless mini-splits is a becoming well-understood, with lots of advice and experience found on this site. There was even a recent a recent blog post by Marc Rosenbaum explaining the criteria he uses when deciding whether ductless heating will work in a given situation, or if ducted is needed. Ductless cooling, like cooling in general, is more complicated. I think there's significantly less collective knowledge about that. Adding a distribution system (ducted mini-split) increases costs and decreases efficiency. How much? There seems to be less less collective experience on that as well, or at least fewer concrete numbers (possibly because performance numbers would depend on the nature of the ducts installed - long vs short runs, number of rooms, etc). In any case, most of the highest efficiency ductless units are single ductless head only (not ducted), and most of the impressive power consumption figures are from these highly efficient units. Geo installations almost always include a whole-house distribution system of some sort, as the units are large and centralized, comparatively. Once you find out which of the above will meet your heating and cooling requirements with the desired level of comfort, compare lifecycle costs considering equipment, installation, energy usage, and other factors needed to make them work like envelope improvements or PV. Then pick the one that is worth the most to you. Yes, even at really low temperatures, mini-splits still perform better than electric resistance heat. Carter Scott's minisplits operate at a COP of ~1.8 even when the temperature drops to 0° F. Strip heat has a COP of 1.0. How the pollution associated with a minisplit compares with a natural gas fired furnace depends on the source of electricity. Clearly, if it's a net-zero energy home with photovoltaics on the roof, the mini-split wins. I haven't dug into the details of utility-generated electricity. The only reference to pollution levels in the article, I believe, was Marc Rosenbaum's claim that going from an oil-fired boiler to an HPWH dropped CO2 emissions by 89%. It wouldn't be as favorable with natural gas. I think there's only one correct definition of New England: Maine, New Hampshire, Vermont, Massachusetts, Rhode Island, and Connecticut. And yes, heat pumps work just fine in Connecticut, too. What do you think I was dishonest about? Is Minnesota enough like New England? This discussion is very timely, and got me wondering. I am building a "good enough" home in Southern Minnesota. 2700 sq. feet story-and-half home over 1800 sq. ft unfinished basement. R-10 slab, R-22 ICF basement walls, R~37 ccSPF/BIB's double stud walls, and R~67 unvented roof assembly (ccSPF & BIB's). I feel as though air-source heat pump(s) may be problematic just because of the number of separate ductless heads that would be desired. But what really I would question is just how well mini-splits would fair in a MN climate (zone 6)? We experienced a total of 22 days this winter where the daytime temp DID NOT CLIMB ABOVE zero (yes... fahrenheit). During one week, the avg. temp was minus 23 degrees. It would take some real convincing for me to abort my plans for a GSHP, but now is the time to investigate, as ground is still frozen. By "honest" I meant (should have said it) that I don't feel that they are ideal for very cold climates (northern New England) unless the envelope is near perfect. You wrote, "I don't feel that they are ideal for very cold climates (northern New England) unless the envelope is near perfect." I disagree. As Bruce Harley pointed out in a comment on this page, "What’s missing from [Allison's] post is a perspective on how these systems can be used for existing, not-so-special (or even really terrible) homes right now to save $ and carbon. Basically anyone in a cold climate who is heating with oil, LP gas, or electric resistance heat could install one of these (maybe two or three at most, depending on the layout of their house) and save 30-60% of their current heating bill, as well as cutting net carbon emissions by a large margin." At -25C/-13F the -FExxNA run a COP of about 1.8 at full speed. The newer -FHxxNA Mitsubishi units are about 15% higher efficiency than the -FE, so they'll probably hit 2.0 running full blast even at -18F. So, for any of the cold-climate mini-splits it's about twice the efficiency, half the power use of heating with resistance electricity when running at below 0F temps. If your 99% outside design temp is -20C/-4F or colder the only ones to consider are the Fujitsu XLTH series (xxRLS2-H) or the Mitsubishi -FExx or -FHxx if you're looking for a single-head mini-split rather than multi-head versions. They're designed to take it, an have output ratings at those temps you can design to. "...if you are using the hot water to heat the same space (ignoring the basement for a minute, just consider it "indoors" as per your comment), it will actually get warmer. You'd be burning electricity and moving heat from the space, into the tank, and then back into the space. " The flaw in that at argument is that the predicated condition "...if heating your space with.." isn't being met. Rather than heating your space, the vast majority of the heat input hot water in most homes goes down the drain- you're heating your septic tank or sewer main with it. In showers you could recover at best about half of it with a drainwater heat exchanger which delivers water to the drain at a temp below the room temp. For most hot water uses that water gets dumped at room temp, and usually much higher. You are moving some of the heat around, by drawing in power from the grid which is a net energy input, but only about half the heat going into the water. That means you need to recover more than half the heat going down the drain for it to be energy net-positive for the conditioned space in the house. The cold water being drawn into the house in proportion to that going out the drain is a net energy loss, a loss that will usually be in equal to or greater than the electricity input to the heat pump water heater- it's still cooling off the house- it's only a matter of how much. Of course this is something that wouldn't be too tough to measure, (though I haven't come across an academic study with the measured numbers.) There is also the secondary effect of the lower heat loss out of the basement with a slightly cooler basement lowering the net heat load, but that's going to be pretty tiny compared to the amount of heat drawn from the conditioned space and dumped down the drain. We disagree, I'm fine with that on this one. We agree on 99.99% of everything else. "Is Minnesota enough like New England?" Yes, it is! I realize it takes some convincing, but this technology really IS ready for prime time! Parts of northern New England also saw days where then average daily temp was well into negative-digits, and it's fully possible to specify mini-splits to cover heat loads at -15F. The number of heads required is less than you might think- the "one head per room" approach is a completely insane (but often assumed) way to go. If the room doesn't have a heat load of at LEAST 5000-7000 BTU/hr it should NOT have an individual ductless head, since it'll be over sized an under performing on efficiency. In non-super-insulated houses it's pretty cheap & effective to install electric cove heaters (sized to the design load of the room) and control them with occupancy sensors enabling the thermostats, which would have a much smaller negative impact on energy use than 5-8 over sized ductless heads. Splitting the output of mini-duct cassettes between two adjacent spaces isn't a rocket-science design problem either. Most slightly-better-than-code 2700' 1.5 story code min homes in climate zone 6 with an additional 1800' of conditioned basement can be heated with 3-4 ductless heads plus a few cove heaters for temperature balance, depending on the layout. With the newer M-series "-FHxxNA." mini-splits the seasonal average efficiency of the mini-splits would hit a COP north of 3.2 in a southern MN location, and with cove heaters controlled via occupancy sensors the all-in heating average COP of coves + ductless would hit in the very high 2s. Also note, Jin Kazama (a frequent poster here) is heating in Quebec with Fujitsu XLTH series mini-splits, a climate more akin to northern MN than southern MN on both the temperature extremes & averages. Given the rate of wind-power development in southern MN, SD, & IA, and the recently approved statewide VOST (value of solar tariff) in MN that is going to put distributed PV installation rates in overdrive, over the lifecycle of the equipment mini-splits will be significantly lower-carbon than any propane or oil fired solution, despite MN's currently high-carb grid. Assuming that the reader can decode all of these embedded quotation marks, here is my response: Bruce Harley was indeed talking about an attempt to use a HPWH for space heating, not for domestic hot water -- so the case under discussion assumed than no water was going down the drain. Bruce Harley was responding to my comment, and I was responding to Jonathan Teller-Elsberg's question: "How crazy would it be to heat a home with a few HPWHs in the basement connected to the baseboard/radiator system?" Is a ground source heat pump connected to a radiant loop (and or baseboard) a common mechanical set up? Q. 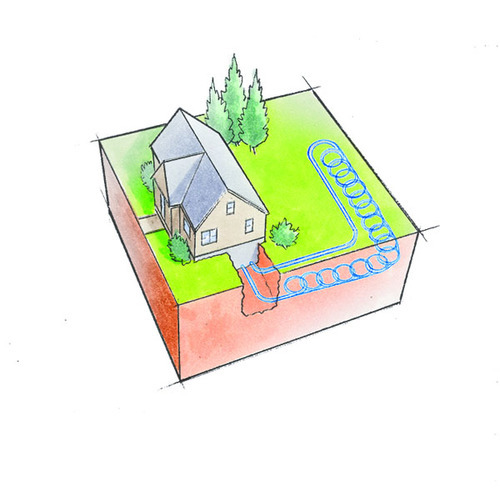 "Is a ground source heat pump connected to a radiant loop a common mechanical set up?" A. Yes. For more information, see Ground-source heat pumps for radiant. I guess skimming rather than reading led to confusion on my part.